I have a a Threadless submission which really needs attention and some big votes, so if you could find the time and dig deep I’d be very grateful for the help. A quick and convenient signup is required if your not already involved and a preferable 5 vote would be good. A straight copy and past of an article by Shaun Hensher on the annoyingly tricky, and widely misconceived subject of pricing for design, a very good read. Getting information on graphic design pricing must be a very frustrating experience for potential clients. There seems to be no consistency. One designer will charge $50 for a logo, while another will charge $10,000. So how is a business owner supposed to know what to do? Please note: I understand that graphic design pricing is a touchy subject and opinions vary. These are my opinions, based on my own knowledge and experience. Agree or disagree, it matters not to me, but let’s try to remain civil, K? Graphic design is not a magical process. It takes time. You want your logo/poster/book cover/web site to be good right? Then you probably don’t want it to be something that someone knocked out in an hour or two, do you? The Association of Registered Graphic Designers of Ontario and Creative Niche put out a National Survey of Salaries and Billing Practices in Graphic Design in 2010. According to this survey, the average sole proprietor billing rate for graphic design services is $73/hr. Brand strategy is an average of $83/hr, and web design is $76/hr. Of course these rates will vary from region to region, but it gives us a good starting point to help us understand what a good designer should cost. Now you may think these rates are high, but remember, a graphic designer can only bill a portion of the hours they work. We have businesses to run after all. Fewer than half the hours most designers work can be billed to a client. Also, we have to pay for our electricity, office space, marketing materials, web sites, professional dues, computers, fonts, software, phone bills, etc. For example, the basic computer setup with the software a designer needs to do their job can easily cost $7500 or more (a good setup can be well in excess of $10,000). And at the rate both computers and software go obsolete, we need to replace these every few years to stay competitive. Did you know that good fonts cost $30-$50 each? A single font family (ie. all the weights and styles of a single typeface) can cost as much as $1,200! Graphic design pricing therefore must be high enough so we can cover these expenses and make enough extra to put food on the table. According to the 2009 census data, the average profit margin for designers is just 13%. So what do you think? Is graphic design pricing too high? Let’s go back to that logo design example. Let’s take a perfectly average designer (in terms of hourly rate). You decide you want to pay $150 for a logo. Your competitor decides they’re willing to invest $2000. The designer, therefore, took about 2 hours to design your logo and a little over 27 hours to design your competitor’s logo. Who do you think is going to have a better logo? Believe me when I say that 27 hours for a good logo that is engineered to meet your marketing goals is not at all excessive. Now of course you don’t have to choose a graphic designer that bills $83/hr. You could decide to choose a designer who is fresh out of school and needs to build a portfolio, and is therefore willing to work for $25/hr. They don’t have much experience, but at least they have formal training and, hopefully, talent. Or you might decide that only the best will do for your company, and you’ll choose an award-winning branding consultant with 25 years of experience who might charge $150/hr. It’s your choice. Some designers charge less than they’re worth. Some charge more than they’re worth, simply because their clients are willing to pay. The vast majority however charge precisely what they’re worth, based on experience and talent. So if you see an ad for a $50 book cover or a $100 logo, you can be assured that you will likely be wasting your time and money. Most of the time they are achieving this pricing by doing sloppy work, copying the work of others, using cheap and cheesy clip art, or paying low-skilled workers minimum wage to pump logos out as fast as possible with no thought towards value or strategy. Ironically, it’s these low-priced hucksters that are the ones ripping you off (and by the way, also making it harder for us designers to earn a living). So how much does it cost to have a _________ designed? That’s a tough question to answer. Asking how much a logo costs or how much a website costs is a bit like asking how much a car costs. What type of car? A luxury sedan? A pickup truck? A supercar? What features? Do you need power windows? Four-wheel drive? There are many factors a graphic designer needs to understand to give you an accurate quote. Given that, I’ll do my best to give you a rough idea of typical graphic design pricing for some common types of projects. The processes for the different types of design projects are similar enough that I don’t need to go through each in detail, but I will share my process for logo design with you. I think you are probably already starting to get an idea, based on my comments above, of what a logo design might cost, but let’s talk a bit about what goes into a good logo. A logo is not just a pretty icon. A quality logo design is based on research and strategy. A great deal of design education is spent learning how to use visual signals to communicate precisely to your target market. What do you want your customers/prospects to believe about your company? Your brand identity (which a logo is one part of) is what allows you to deliver that message. Research: I start by gathering as much information as I can about your business. I want to know everything there is know about you, your competitors, your target market, and your marketing goals. Part of this comes from the initial consultation and communication with you, and part comes from primary research. Brainstorming: Once I feel I have enough information, I start mind-mapping and brainstorming. This involves exploring all the possible mental associations with the key concepts stemming from the research phase. Ideation (a.k.a. sketching): After the mind-mapping and brainstorming, I finally get to put pencil to paper. Yes, that’s right, I said pencil and paper. I sketch. Like mad. I will sketch as many ideas as my brain can come up with. Pages full. Once my hands and brain are cramped, I put the work down and do something else to get my brain to switch modes so I can evaluate the ideas more objectively. Usually I sleep on it. Rendering: With a fresh mind, I go back to the sketches and start critically evaluating the concepts. I’ll take the best ideas, clean them up, and then boot up the computer. I will render the concept in Adobe Illustrator, usually in black and white. Review: Now that I have a few ideas to show you, it’s time to work together again. We review the concepts, discuss which idea works best, and suggest improvements. Refinement and colour exploration: Now that the concept has been decided upon, I take all the suggestions and and make the changes to the logo design. I also go back to the original research and start working colour into the logo, based on a combination of personal aesthetic choice, client preference, and colour theory (Apologies to my American friends for my insistence on adding a “u” to color). There will also be further exploration and refinement of the typography. Review: Again, we will review the design together and decide on final refinements. Perfection: I guess that’s a weird term to use for someone who is normally so modest (it’s one of the many traits that make me so awesome). Nevertheless, this stage is essentially refining the design to the point where it is ready for the world to see. Approval: Of course, just because I think it’s ready doesn’t mean you do, but if you’re happy, then the design is approved. File output: Once the project is complete, I will output the logo in several file formats and sizes. As you can see, I didn’t mention waving a wand or snapping my fingers anywhere. I did however go through a process that takes many hours to complete. At this point you’re probably thinking “Answer the damn question already!”, so I’ll try my best. This process can take anywhere from 15 to 40 hours, depending on the designer, the client, and the budget. A fresh graduate might charge $300 – $800 . A branding heavyweight might charge $2,000 – $6,000. A good designer with some experience under his or her belt will likely be in the region of $900 – $3,000. So unless you get really lucky and manage to find a talented designer who is desperate for work, you should definitely try to have a budget as high over $300 as you can manage. Also, unless you’re Scrooge McDuck, I would recommend staying away from the super high end rock star designers. You can easily find a talented and seasoned designer to do a logo for less than $3000. Bare in mind, you will also want to make sure you have a decent budget for other components of your brand design, such as your business card, letterhead, and website. I highly recommend working with one designer for everything. Usually you can get a package deal, which will save you money. Ok, so now that we understand a bit more about the design process, let’s go over a few more examples. Business card design can vary quite a bit. Do you need a simple, one-sided, straight-to-the-point card, a nice elegant, double-sided, creatively designed card, or do you want something really special? Brochure design also varies dramatically, depending on the content. Book cover design doesn’t vary quite as much, but you still have to consider a few factors. Is it just the front cover for an eBook? Is it a full dust jacket? What goes on the back and spine? Do you want something straight-forward and simple or do you want something high-concept? site with multiple sections and complex structure are two entirely different beasts, and there’s an infinite amount of variation in complexity and breadth. I’m not even sure I want to tackle this one but you came here for answers, so I’ll give it a shot. Let’s assume we’re talking about a standard site between 3 to 9 pages. I know that’s an absurdly wide range, but that’s the nature of web design. If I was forced to narrow it down, which I guess in this case I am, I’d say the average site falls somewhere between $1500 and $4500. So there you have it. You are now armed with at least a rough idea of what constitutes reasonable graphic design pricing. As with any major investment, you should shop around. Try to get a quote from 2 or 3 different designers. Of course the cheapest isn’t always the best, so look at value. Is it worth it to up your budget a bit to get access to a better designer? Maybe, but of course high prices don’t always mean high quality. So what about design contests? I’m going to try not to pull my hair out. In case you are not familiar with the idea, design contest sites allow you to post a project and get many designers to submit their ideas. You then select your favorite. This may sound enticing, but design contests are a serious gamble. First of all, you still have to shell out at least a few hundred bucks. Second, look again at the process I outlined for logo design. Do you think you will get that kind of quality research, strategy, and hands-on involvement from some teenager in Bangalore? By the way, some of these sites have been known to allow children to participate. You’ll also have to invest quite a bit more of your own time in the initial creative brief and the feedback process. Lastly, these sites are seriously damaging the design industry. I know that’s not your problem, but how would you feel if this started happening to your business? Really, it’s a bit like going out for dinner and getting dozens of chefs to prepare a meal for you, then only paying for the one you like. Is that fair? Save your money. If you can’t afford an experienced designer, find a student or recent graduate. Otherwise, save your pennies and get the real deal. A message to designers participating in this practice: You are hurting your own industry and devaluing yourself. Spec work like this is seriously frowned upon by professional design associations. If you are doing it to build your portfolio, there are better ways. There are many not-for-profit organizations that could use your help. Find one you believe in. They make amazing clients and you can be proud of the work you do for them. Ok, then what about stock designs and templates? Don’t get me started. Do you really want your business to be confused with a thousand others? I know that was a ton of information, but I hope it has helped you understand graphic design pricing a little better. If I’m to leave you with any sort of message, it is this: Good design is an investment. If you are serious about the success of your business, which of course you are, you know that sometimes you have to spend money to make money. I’m not suggesting you need to go out and spend a huge wad of cash on a design overhaul of your business, but if you do decide a graphic designer might be able to help you improve your business, don’t waste your money on crap. Be smart about it and spend what you need to. Here be a project I set myself for fun.. 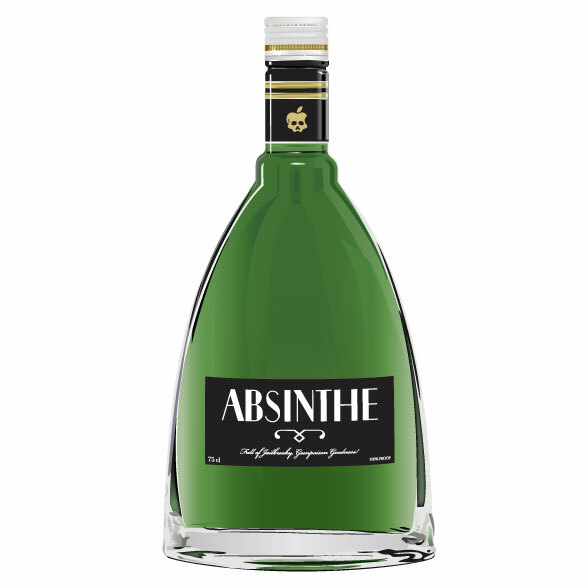 I wanted to do a little bit more icons and thought I’d do the Absinthe icon with an actual Absinthe bottle. I threw in a font I customised which I may create to a whole font from, or not. Here be the most recent piece of work. As always I used Posterman Markers along with India Ink. Sadly the piece is now in two pieces, but I hoping to repair it as soon as possible. The quality isn’t so great because its 3GS quality.